I am back with one more Vegetable carving. These days I don't get enough time to do all these things. 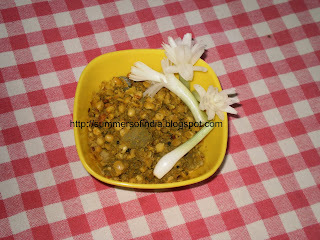 Just rustling up a passable dinner after a long and tiring day in itself has become difficult for me. Shame on me. Where has all the enthusiasm gone? 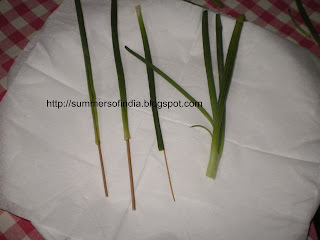 Select a bunch of fresh looking spring onions. See that the greens are healthy and not wilted. The onion bulbs should be long and not too fat or round. Now place cuts on the base (root side) of the bulb, first in + shape and again X shape taking care not to separate the pieces. That is the cuts should be up to 3/4ths of the bulbs. Now place the bulbs immersed completely in cold water and keep it in the refrigerator (not in deep freeze) for half an hour or so. This will open the cut portions apart like petals of a flower. After half an hour or so the bulbs open up like a flower. 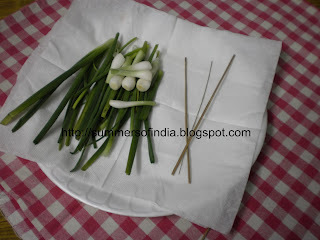 Now pass the sticks or wire through the hollow greens of the spring onion. If you use wire you can twist or bend a little to give it a required shape. At the end attach the flowers and arrange in a vase according to your taste. I have used the dried veins of the coconut leafs cut into required lengths. Here are the pictures. I think you can follow them. But if you don't let me know please. The greens separated form the bulbs and the sticks. Pass the sticks through the greens of the spring onion. Attach the flowers and arrange them in a vase. Or you can just garnish a dish according to your fancy and serve. 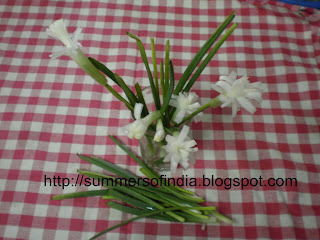 These flowers can be made a day before and stored in refrigerator if you are planning a party. But store carefully without damaging the petals. So why don't you try and let me know.